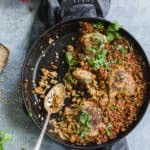 Spanish Chicken and Rice- Time to try the most comforting dinner ever! Filled with flavor and incredible spices, this dish is sure to please everyone for Sunday supper! Start by preheating your oven to 380 degrees. Add ground cumin, adobo seasoning, chili powder and paprika to a small bowl and whisk together until combined then set aside. Pat chicken dry on all sides with a paper towel then season chicken pieces with salt and pepper to taste on both sides. Sprinkle about a ⅓ of the seasonings on chicken on both sides and set the rest to the side. Add butter with canola oil to Dutch oven over medium high heat. Once it’s melted, brown chicken on both sides until a golden brown color develops then remove chicken from Dutch oven and set aside. Next add onion, peppers and chorizo to Dutch oven and cook until they are tender and sausage is nice and browned. Add tomato paste and mix in well. Next stir in rice along with chicken stock, lime juice, diced tomatoes, pigeon peas, garlic powder and remaining spice mix and bring to a boil. Once boiling, bring down to medium low heat and cover lid for 30 minutes. Next remove lid and add chicken to the Dutch oven and place in the oven and cook for another 40-50 minutes or until chicken is completely cooked through and the rice has absorbed liquid and is nice and soft. Cool for 10 minutes then top with cilantro and serve.